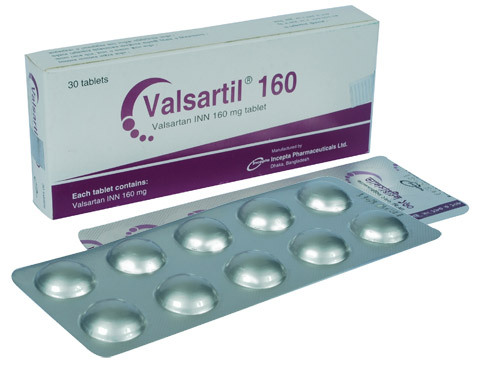 Valsartil 40 : Each tablet contains Valsartan INN 40 mg.
Valsartil 80 : Each tablet contains Valsartan INN 80 mg.
Valsartil 160 : Each tablet contains Valsartan INN 160 mg.
Valsartan is an oral medication that belongs to a class of drugs called angiotensin receptor blockers (ARBs). It is orally active and specific angiotensin II antagonist acting on the AT1 subtype. Angiotensin's attachment to the receptors cause the blood vessels to narrow (vasoconstrict) which leads to an increase in blood pressure (hypertension). 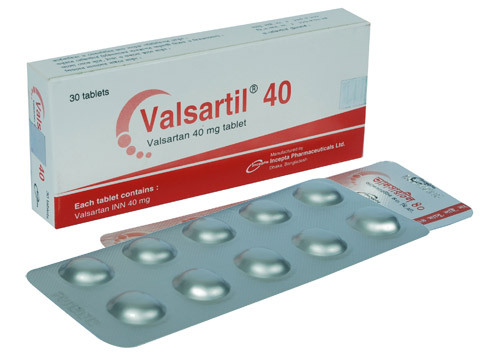 Valsartan blocks the angiotensin II receptor. By blocking the action of angiotensin, Valsartan dilates blood vessels and reduces blood pressure without affecting pulse rate. Valsartan has much greater affinity (about 20,000-fold) for the AT1 receptor than for the AT2 receptor. It does not bind or block other hormone receptors or ion channels known to be important in cardiovascular regulation. The usual dose of Valsartan is 80 to 160 mg once daily. The maximum dose is 320 mg daily. Maximum blood pressure reduction occurs within 4 weeks. The usual dose is 40 mg twice daily and may be increased to 80-160 mg twice daily. The initial dose after myocardial infarction is 20 mg twice daily. The dose should be increased with a target of 160 mg daily if tolerated without side effects. Administration of Valsartan with food decreases the absorption of Valsartan by about 40 %, so it should be taken on an empty stomach. No initial dosage adjustment is required for elderly patients with mild to moderate renal and hepatic insufficiency. Geriatric use: No overall difference in the efficacy or safety without some exception. Valsartan is generally well tolerated and side effects are rare. The most common side effects include headache, dizziness, fatigue, abdominal pain, cough, diarrhea and nausea. Patient may also experience hyperkalemia, impotency, reduced renal function, allergic reactions, dyspnea, constipation, back pain, muscle cramps, rash, anxiety, insomnia and vertigo. Hypotension may also occur if patient have been taking diuretics along with Valsartan. Impaired Hepatic Function: As the majority of Valsartan is eliminated in the bile, care should be exercised in patients with mild to moderate hepatic impairment including biliary obstructive disorder. Impaired Renal Function: Dosage reduction or discontinuation may be required with patients having pre-existing renal impairment. Heart Failure and Myocardial Infarction: Caution should be exercised when initiating therapy in patients with heart failure and post-myocardial infarction patients. Pregnancy: Valsartan should not be used in pregnancy, as in 2nd and 3rd trimester it can cause injury and even death to fetus. When pregnancy is detected, Valsartan should be stopped as soon as possible. Nursing mothers: It is not known whether Valsartan is excreted in human milk. Because of the potential for adverse effects on the nursing infant, a decision should be made whether to discontinue nursing or discontinue the drug, taking into account the importance of the drug to the mother.